Toner Machining Technologies who specializes in the design and build of work holding fixtures continues to branch out and offer a greater range of services by combining efforts with Jeffreys Manufacturing Solutions and Specialty Tool, Inc. located in Rock Hill, SC to complete a turnkey project for Stanadyne Automotive. 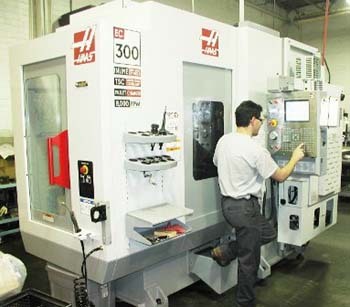 The project focused on a Haas EC-300 horizontal machining center, tooling was specified and provided by Specialty Tool, and TMT designed and built the work holding fixtures, wrote and debugged the CNC programs, documented tooling set-up sheets and gaging instructions, and ran the process capability studies required for machine approval. The machining operations were performed on a series of component assemblies that are utilized in several diesel engine applications. The parts were face milled, bored to a precise diameter, chamfered on each face to a specific depth, and ID chamfered to insure a consistent bore opening. Specialty Tool specified tooling that was consistent with current production tooling. Dan Allen, President of Specialty Tool selected two standard Iscar cutters to complete the straddle milling operation. The chamfer tool is a double ended Heule used for quick and accurate chamfering of both sides of the part. Allen stated that “the tooling package is very reliable which is extremely important in a high production application”. TMT supplied two hydraulic fixtures designed for each type of assembly. A stand alone hydraulic pump was custom plumbed to an independent hydraulic rotary union connector on each fixture. The fixture locators were designed to easily and accurately position six or eight parts per machine face. The fixture is actuated by an operator friendly control valve and a pressure gage is visible to verify proper charge. TMT programmer, Danny Littlejohn wrote the CNC program in a format which allows each part nest to accept individual tooling offsets which is particularly important for operator understanding. In addition to the standard detailed fixture manual, TMT provided a complete set of operator instructions with the project. All data was supported with digital photos to facilitate operator training. A bill of material of each tool and required set-up data was included. Part loading and fixture actuation instructions were also included. Inspection requirements and gaging frequencies were outlined in a systematic fashion. The groups’ efforts resulted in a successful four hundred piece machine trial in which the target cycle times were achieved and a minimum of 1.67 CPK were attained on all key characteristics. TMT president, Jim Toner stated that “we are extremely proud to be part of the project success. The teams from Jeffreys, Specialty Tool, Stanadyne, and TMT worked very well together. In addition, we truly value our relationships with numerous machine tool distributors and tooling suppliers and look forward to new turnkey opportunities in the future”.